It is the time of the year when many folks get out the creative thinking cap. We take pictures and make cards, mousepads, magnets, etc for our family, friends, co-workers, etc. Did you ever think of adding a font with decorations in it? There are fonts with snow flakes, Mickey Mouse, Santa, and so many more variations to 'spruce' up your cards and images. I am not one to go crazy adding many different decorative fonts so the card looks like something out of a spy movie ransom note. However, a different font adds a certain flair to the image. 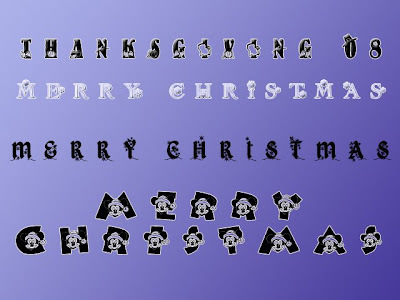 There are hundreds of sites with holiday fonts. My only suggestion is to 'google' holiday fonts, Christmas fonts, etc and you might be amazed what you find is available for free. Below is a small image with a sample of what is available on the net. Get out the creative cap and try something different.